Our family really likes oatmeal. We eat it every day all winter long. There are variations of it but this is the basic recipe. 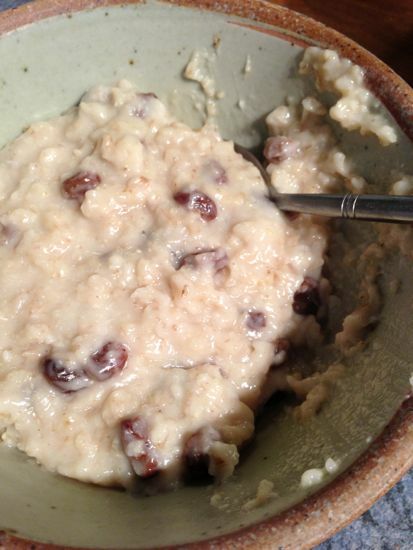 The trick to good porridge is cooking it slow. We bring the oats, banana, water and milk to a boil then turn it right down to a simmer. Then, depending on how hydrated you like your raisins, you add them and the coconut. We like to chop ours into big chunks. It is fun to get a little of the unmelted coconut in your bite. We usually let it cook on the stove, go get the kids ready for the day and set the table, and by then it is done. Typically 15-20 minutes. Stirring occasionally. With a sprinkle of coconut sugar and a dash of milk, or nothing at all, this breakfast is a fantastic way to start your day. Enjoy. 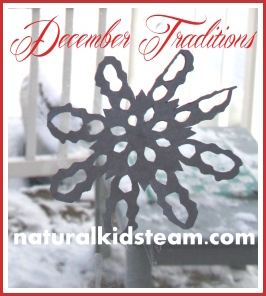 One of the lovely things about the holidays, for me, is remembering traditions from childhood and passing them on. 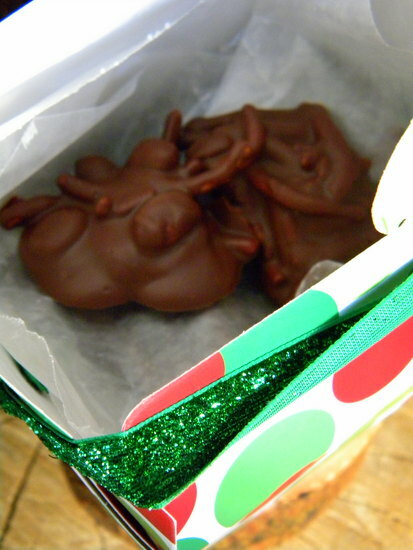 A favorite Christmas treat around my house are my Grandma’s favorite, Chow Mein Chocolates. Growing up, my Grandma lived just up the road from us on a dairy farm. I remember her and I making these before the holidays most years. Then, whenever I would go visit her she would say, “go get the Chocolates!”. I always knew right where they were, in the cold stairway leading upstairs. I would open the door and feel the blast of freezing air come into the room. I would fumble for the right freezing cold, tin can (there were many) and close the door fast! Then Gramma and I would sit playing Chinese checkers, chatting, eating and laughing. 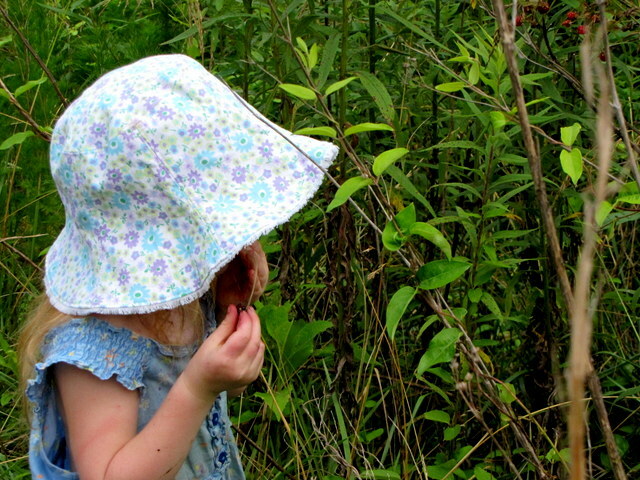 My children, like all children I think, love to hear stories about my childhood. Today, I told my son Michael the above story while we made Grandma’s chocolates. Another story I love to tell is how she would always ask me, “What is the first rule of baking?” I would come up with all sorts of silly answers for her and she would say, “No, the first rule is to wash your hands”. And so I would. 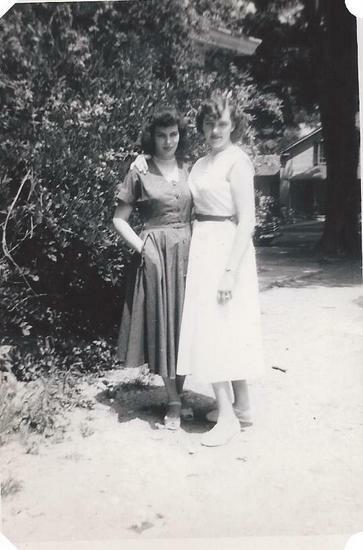 Now, I ask my children the same question and if they come to me with unwashed hands I say in a lilting tone, “Grandma would be mad…” My son Michael knows just what I mean and runs to wash.
My beautiful Grandmother on the left, long before I knew her. 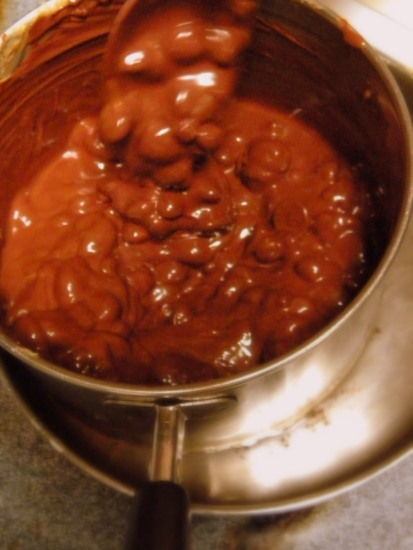 Melt in a double boiler. Add large can of Chow Mein Noodles and 2 cups of Spanish Peanuts. Stir. Drop on wax paper & cool in the fridge or freezer. They make a beautiful & tasty gift as well. This year I’ll be sending my Gramma a tin can full. I hope they will bring back the same fond memories for her. I try every occasion to make my own dressing and convince the Ranch junkies in our family that a homemade dressing is ultimately better tasting and healthier for you. Recently I succeeded in finding a recipe everybody likes a lot. I had to make a salad for my women’s bible study group. I found the recipe in the book we used for out bible study. Kelly Minter’s book Nehemia has a couple of recipes at the end of each section. The women in our group take turns cooking. This weekend was my turn. Since the family had nothing to eat for lunch I thought I’d make another batch for them while I was at it. Turns out they really loved the salad dressing. Mix all the ingredients except for the oil together. Then whisk in the oil. Now I just use this as an everyday dressing for all kinds of greens. It is simple to make and the kids love it! 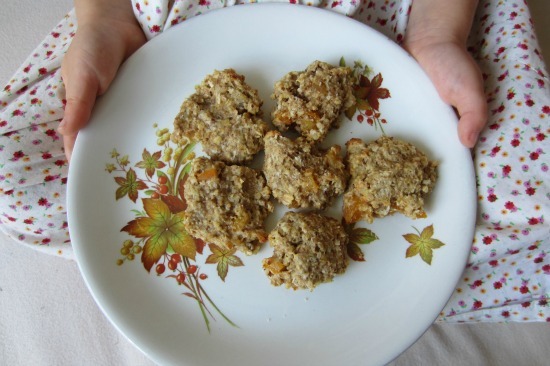 This is a sugar free cookie that my kids just love, and I originally started making to get some good fats into my tiny 1 year old who seemed to live off of thin air. They’re sweetened with very ripe bananas, which I keep in the freezer so I always have a supply for making these cookies! 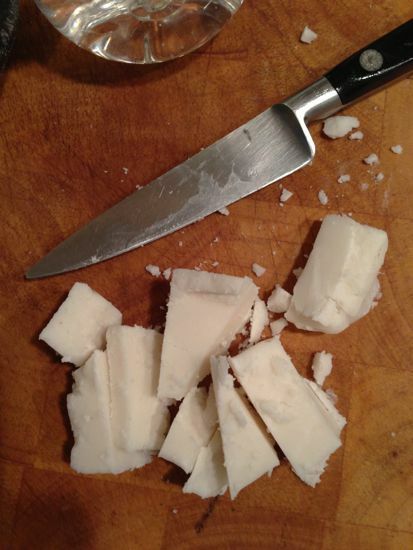 some dessicated coconut if desired. Preheat oven to 350F/Gas 5 / 180°C / 145°C fan oven. Melt butter in microwave in large mixing bowl. Add bananas and mash. Add egg, mix. Add all remaining ingredients and mix. Make into cookie shapes and place on baking tray. Bake for 12 minutes or till lightly browned. This lovely recipe was sent in by new NaturalKids team member Rachel from LittleWoodlanders on Etsy. Please go visit her shop and check out the cool toys she creates. Her recipe looks really yummy, and I am hoping to try it with my kids very soon. We love this sugar free, healthy recipe, packed with goodness! We make these about once a week, and on these days, I’m happy for my kids to snack on them as much as they like, or have them for lunch! 1. 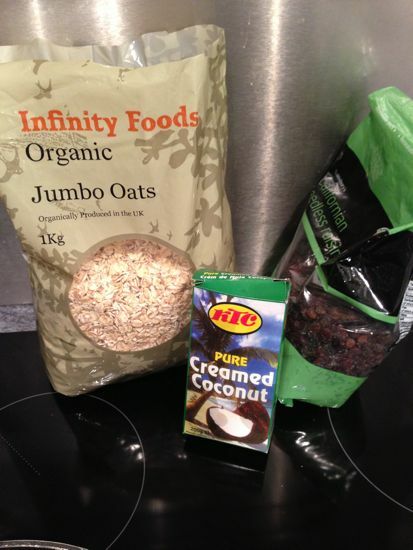 Whizz up the oats and coconut, and then the raisins, in a blender or food processor. 2. Mix all together, press into greased pan to about 1/4 inch thick (one cm). I use a metal pan approximately 11” x 10”. 4. Cut into bars and let them cool, they’re less likely to fall apart. They keep a few days left out in a tupperware, but I usually freeze them as soon as they’re cooled, and leave out enough for a day or two. 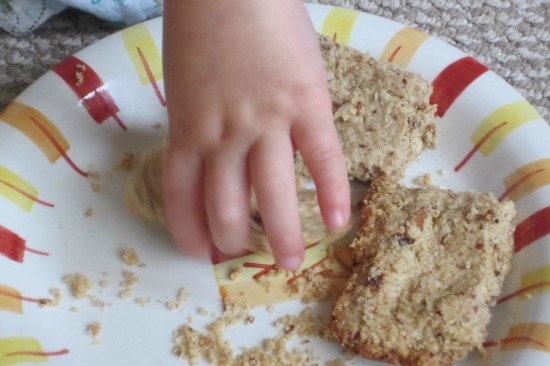 The trick to getting them to stay together is blending up the oats, coconut, and raisins. This smooth consistency keeps them from falling apart easily. I, like most parents, do not approve of our school lunches here and have to arm my arsenal with an array of interesting choices beyond pb and j! Sometimes it can be very difficult to come up with creative ideas that your kids will actually eat without breaking the bank! What my kids like is a break from sandwiches and soup and most of the time they like to eat it plain or with crackers. Here are a few of our most loved recipes. I make enough for myself to take to work as well. My kids and I love chicken salad and its so versatile, plus you can make it as low fat as possible. This recipe is very easy to use lowfat mayo; you can’t even tell the difference. Just a suggestion to use half the dressing first then add as you prefer. We don’t like our chicken salad swimming in dressing and I think I only used 2/3 of it. 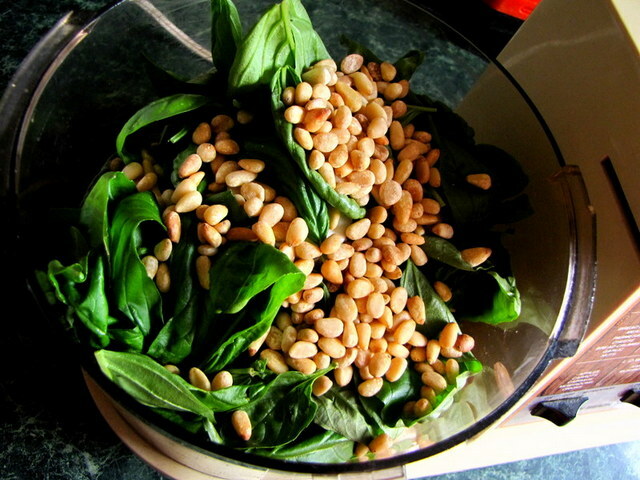 Pesto Pasta Salad: so versatile, you can add or substitute anything to fit your dietary needs. I find every opportunity to add as many servings of veggies as I can. Mediteranean Orzo Salad: What i love about this salad is that its really light but filling at the same time. To save money I actually use the olive and antipasto bar at my grocery store for the feta, olives and artichokes. Its cheaper than buying each separately unless you are using them in other recipes. This can be tossed together while its cooled. The lemon is really bright and brings a nice balance to the other flavors. If your not a fan of red onion you can soak it in ice water before you cut it; that will reduce the strength of the flavor. Our family loves soup. In the winter I make a big pot of soup about every other day. I really had dismissed the idea of making soup since it’s been so hot all summer. Colorado residents have endured sweltering heat for nearly two months now. Seems that every record in the book has been broken. Who wants to add more heat to the globe? Hot soup has been out of the question. But for centuries people in Spain have been preparing Gazpacho. Our family had the pleasure to visit Spain this year. 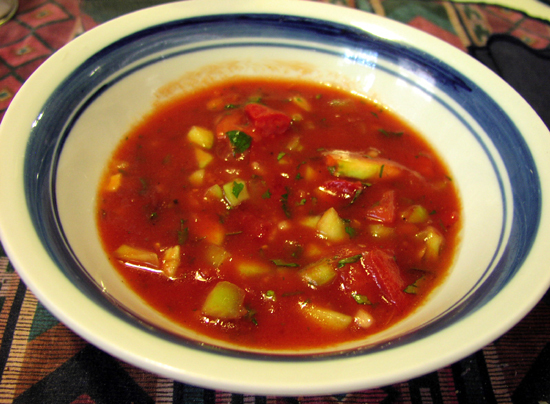 Gazpacho is a cold vegetable soup that is served during the hot summer months in Spain. It is very refreshing and a great vegetarian summer dish. This recipe is a bit labor intensive because it involves a lot of chopping. Other than that you will love it because it will not warm up your kitchen one bit. Make a big pot of it. Maybe you want to double the portion for company or in order to have some left over. 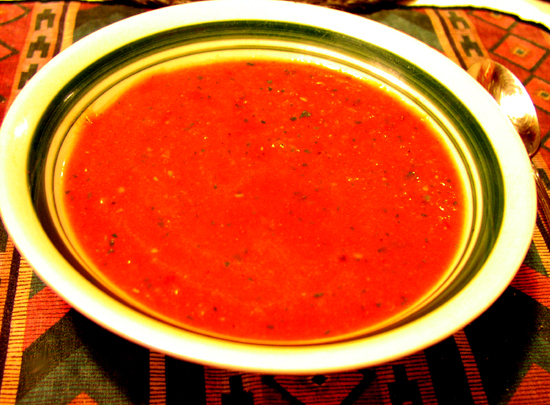 Gazpacho’s flavor is even better after chilling in the refrigerator for a day or two! Put the tomato juice in a large non-reactive pot or the bowl you are going to serve the soup from. Add all the other ingredients and stir. Chill in refrigerator. If you prefer your soup without chunks you can run it through a blender. We had the chopped version on the first night. After sitting in the refrigerator over night I took the soup out and blended it with an immersion blender. It was much better that way! I loved it. Spaniards like to add breadcrumbs to it. I prefer this pure vegetable version. 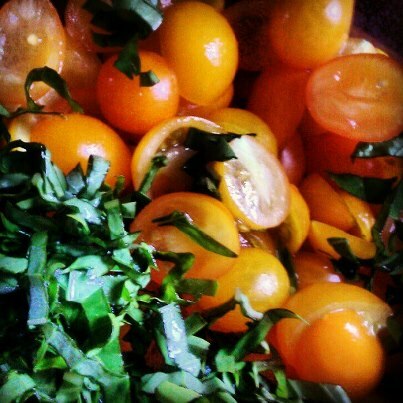 It tasted fantastic with the vegetables harvested fresh from the garden. I received this delicious recipe many years ago at a healthfood store. As the temperatures in Colorado have been soaring into the 100s each week we prefer cooking meals that don’t add more heat to the house. The main ingredient in this dish is Quinoa, an ancient grain grown by the Incas and highly prized for its nutritional value. For one, I like that it cooks very fast. You treat it just like rice. Bring water to a boil with quinoa in it. Simmer over low heat until all the water has been absorbed by the grain. 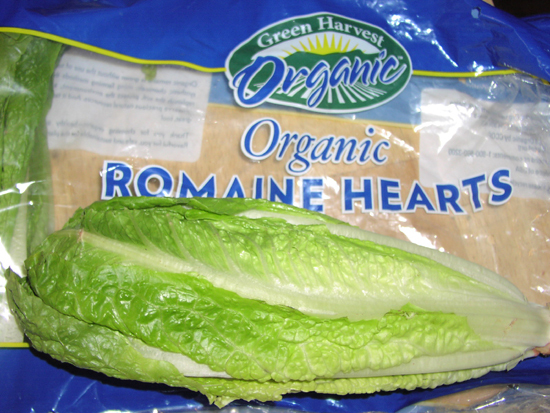 You can prepare it more simply if you don’t have the time and ingredients for the salad. You can add olive oil, sea salt, and a bit of lemon juice and have a simple sidedish ready to go! Last but not least, compared to other whole grains, quinoa has the highest protein content. It is a perfect food for vegetarians and vegans providing essential amino acids and a perfect source of protein. 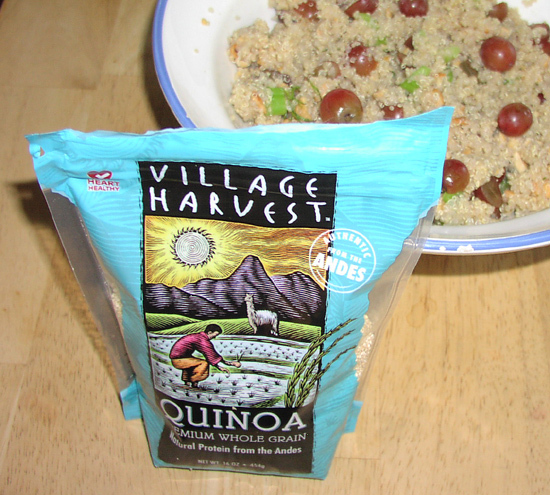 Quinoa is also a food that is free of gluten and cholesterol. Why are you ready to try it? This salad dish is great for summer picnics. It looks very pretty and it surely will surprise some of your friends who may never have used the grain. Cook quinoa grain according to package directions. Make sure all the water is absorbed by the grain or you salad dressing may end up too wet. Make the dressing mixing vinegar, mirin, salt. This dressing has no oil. The only oil comes from the nuts added to the dish. Toss dressing and the remaining ingredients. As a variation you could use other herbs such as arugula, fresh mint leaves, or marjoram. 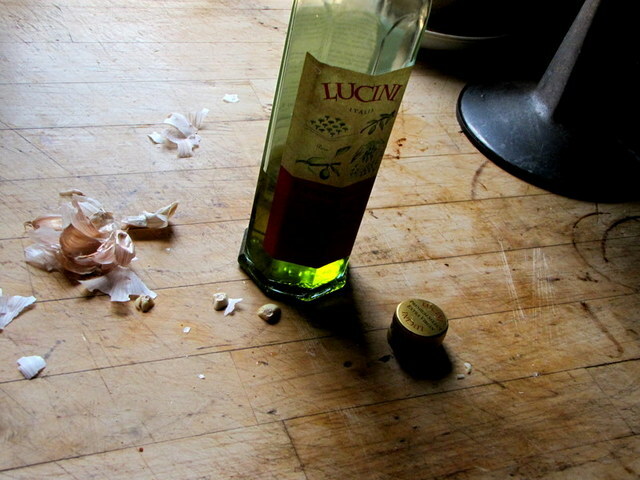 It is also possible to replace the raspberry vinegar with apple cidar. My kids do love the unique taste of raspberry vinegar. It is the more pricey ingredient unfortunately. 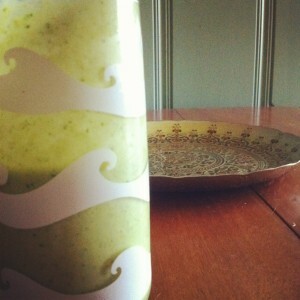 A sure way to cool off in the summer heat and a great way to get your greens! Put everything in blender and combine until frothy. 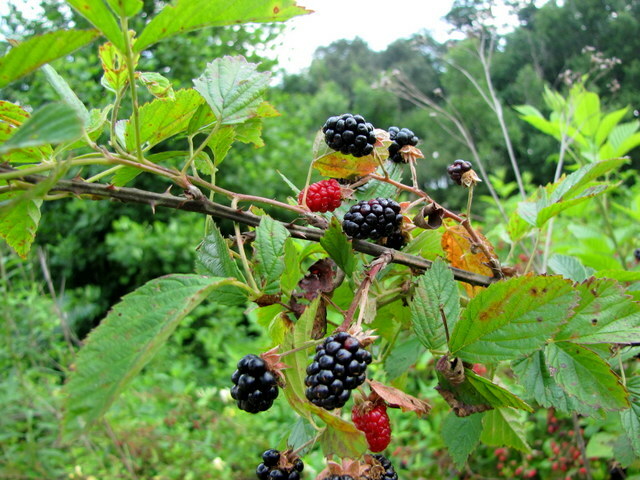 We are knee deep in blackberry season and making the very most of it. 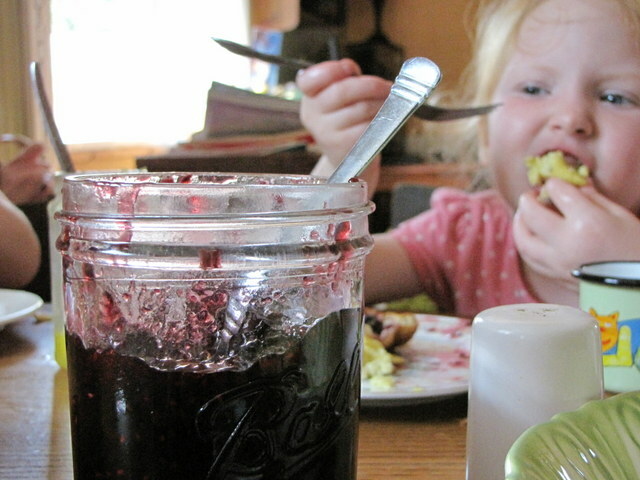 Blackberry cobbler, blackberry galette, blackberries in our oatmeal, our lemonade… And, for the very first time, we made blackberry jam, aka, summer in a jar. Oh my, is it ever wonderful! I’ve only ever pickled before but was very excited to try something new. And turns out, it’s super easy to do! 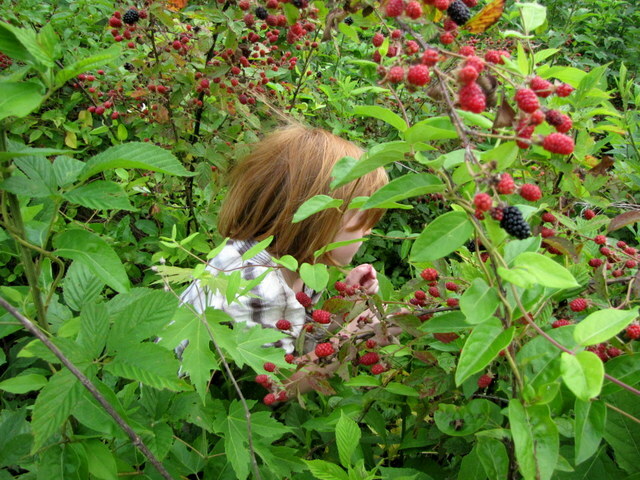 Step one, find a thick patch of blackberries and pick and pick and pick til your fingers and mouths are completely stained. No matter the thorns, you’d be hard pressed to pull my little ones out of a blackberry patch til every last berry is either in their basket or tummy. Step two, wash the berries.. and eat many. 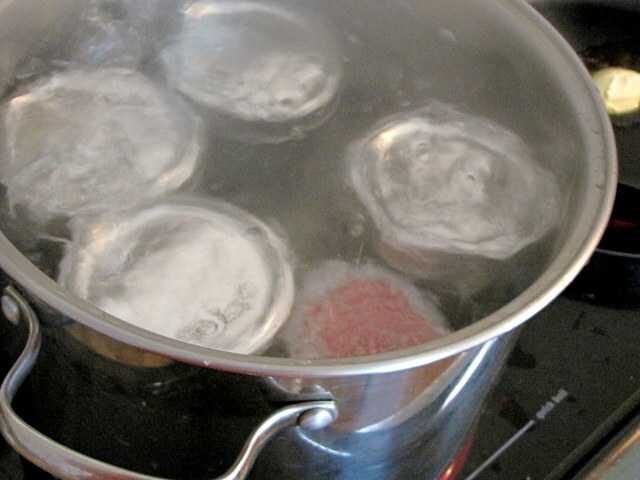 Step three, prepare your jars by sterilizing in boiling water for about 10 minutes. If you’re going to be putting jars away for eating later then you will also need to put your lids in a pot of hot (not boiling) water. Leave everything in the hot water til ready to fill. 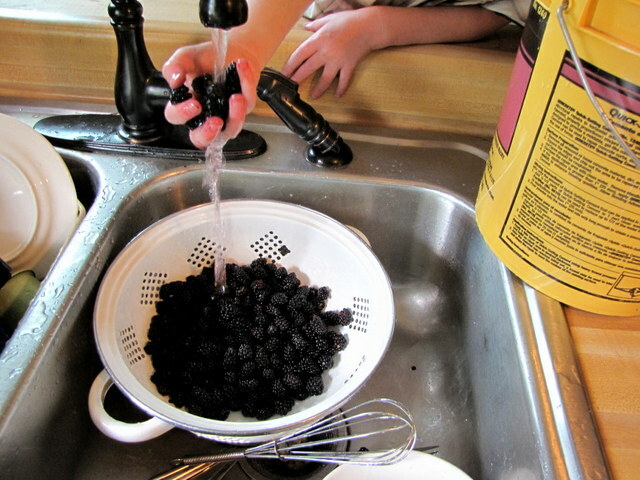 Step four, measure out your blackberries and place them in a large, heavy saucepan. For every cup of berries you will need about 1 cup of sugar (more or less to suit you) and 1 teaspoon lemon juice. Now, I’ve very interested in trying to make sugar free jam. But since it was my first time I didn’t feel confidant enough to mess with it. Step five, put the other ingredients in the pan with the berries and smash everything together til the berries are as smashed as you’d like them to be. I like to leave some whole. Step six, over high heat bring the berry mixture to a boil and, while stirring constantly, allow to boil for about 5 minutes. If it’s bubbling over the pan do turn it down just a bit. Now turn it down to medium and let it continue to cook for another 15 minutes. At this time put a spoonful on a plate and stick it in the fridge to cool down a few minutes. Check to see if it’s still running or stays put. It’s ready when it stays put when you tilt the plate. If 15 minutes isn’t enough (wasn’t for me, I had to do the fridge test several times) then continue checking it in the fridge in 5 minute intervals. Step seven, when it passes the fridge test spoon it into your jars and place the hot lids on right away. If you plan to eat your jam right away, you are finished. Allow to cool completely and enjoy! Otherwise, move on to the next step. Step eight, if you want to put some jam away for eating in the middle of the winter or plan to give as gifts, then you will need to process your jars in a hot water bath. So, in a large pot (stock pot works) of boiling water, lower your jars in very carefully, preferably with jar lifting tongs. Make sure the water covers the jars completely. Allow them to boil for about 10 minutes. Step nine, remove the jars with the tongs and allow them to cool. As they cool you will hear the lids popping. If one doesn’t pop then it hasn’t properly sealed and will need to be eaten within a week. Enjoy on popovers and toast and PB&Js and snuck by the spoonful when no one is looking. 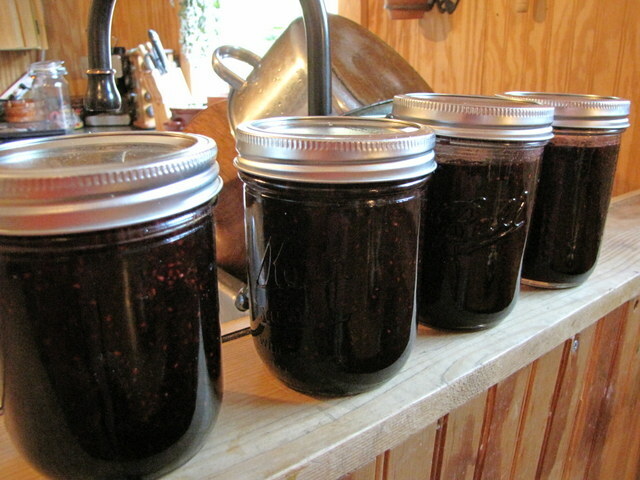 And if you’re able to put at least a jar aside til later, then enjoy your blackberry jam in the dead of winter and remember the warm days so full of sunshine and berries.